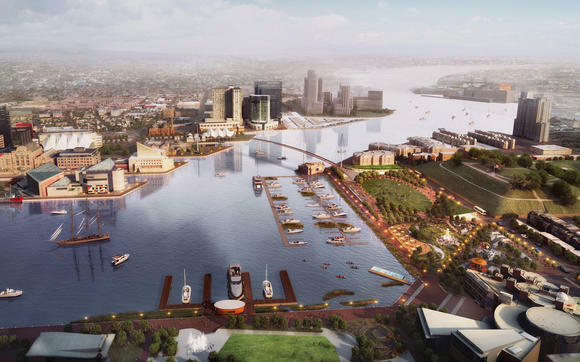 City leaders unveiled an ambitious long-term plan for the Inner Harbor Wednesday designed to restore pizazz to a vital area that’s beginning to show its age. The “Inner Harbor 2.0” plan calls for constructing a pedestrian bridge to connect Harbor East with Federal Hill, turning Rash Field into a grassy park and squaring Light Street to link McKeldin Plaza to the harbor amphitheater. Other elements include a kayak launch, bike share program and urban beach, featuring a floating swimming pool. I moved to Federal Hill this year and was expecting the Inner Harbor to be amazing. Okay, before I start, the Inner Harbor is very nice, and a great place to walk around to kill time or get something to eat(pricey though). I expected there to be plenty of day drinking events, sports, concerts, etc, but it’s kind of boring. Adding a beach and park along with the bridge from Fed to Harbor East could really improve the social life down there. Bike share, kayaking, and other sports events will also be a plus. These renovations should hopefully bring some events to the Inner Harbor which will make it much more appealing for the 20-30 year old crowd. A lot of potential in this plan. I like what I’m seeing B-More. This entry was tagged Baltimore, Inner Harbor, Inner Harbor Renovation. Bookmark the permalink. ← Who Throws a Shoe?